There are a few items that are not immediately obvious from the chart above. The 320i is a crap car that BMW sells to make that price point. If you want a decent car, for example if you wanted the “Driver Assistance Plus” package, you must get a 330i, which starts at 38,000. Even the “safety options” are missing from the 320i. Tesla Autopilot is miles ahead of the others just from its ability to be constantly updated from fleet learning. 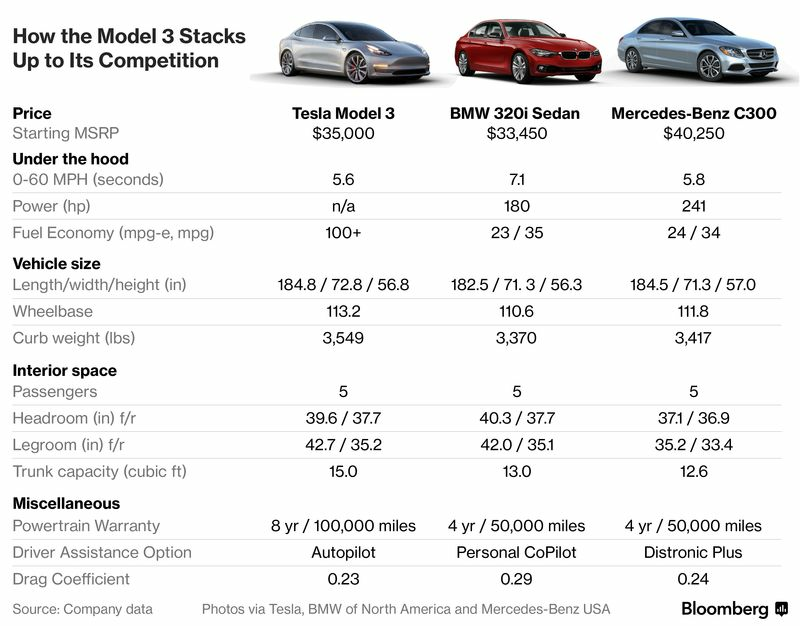 The base Model 3 is only 5% heavier than the BMW 320i and 4% heaver than the Mercedes C300, which means it has very little EV weight penalty. The list above only shows 100+. They really mean “100++”. My expectations are on par with the Hyundai Ioniq which has 150 city / 122 highway. 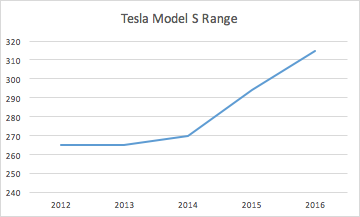 The Bloomberg article from the chart above came was titled “Driving Tesla’s Model 3 Changes Everything”. Here is MotorTrend. Here are Forbes, The Verge, Wired. I could go on and on but every review is glowing. The only complaint so far is that a loaded Model 3 costs close to 60,000. I’m not sure these reviewers have ever tried to configure a loaded car from the competition. 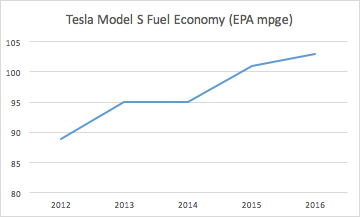 Here is how fast Tesla is improving. Then go compare a 2017 car of any make to a 2012 car and try to find the improvements. Why would any buyer of a car in the price/size range in which a Tesla is available buy any other car? Tesla even offers all new software features to all existing owners over the air. The actual availability of the Model 3 will make things even worse for other compact luxury sedans. 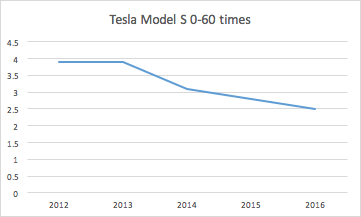 Tesla gave me a way earlier than expected estimated time frame for my Model 3 of Dec – Feb. I’m not an employee or Tesla owner and I’m on the east coast. I didn’t expect the car until at least the middle of next year. Here’s to hoping that Tesla can actually get me the car by Feb 2018. 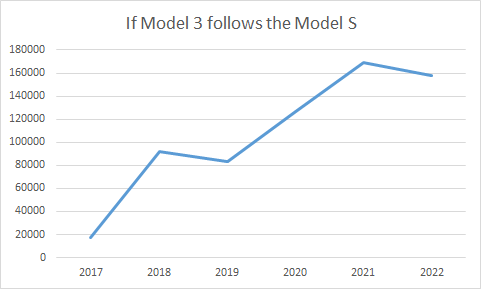 With so much attention and the reservation numbers, I expect the Model 3 to have more sales in 2018 than that chart shows in 2021 as long as Tesla can make them. Times are going to get interesting soon for the luxury auto industry that is just standing still with no plans for any compelling cars in volume until at least 2020, probably 2025. I’m sure every major auto manufacturer is bracing for the impact of the Model Y in a couple of years as they are currently trying to make up for lost sedan sales with SUVs. But what can they do with no current plans of a fast charting network or a compelling electric car? Anyone who has used any electric car, even the Leaf (we’ve been using a Leaf since 2013) knows that a gas car can never compare in driving to an electric car, no matter how good the car is. Plus, home fueling, especially with renewable energy, rocks.